Budgets are tighter than ever and a record 85% of people say fuel prices are their number one worry, so Which? 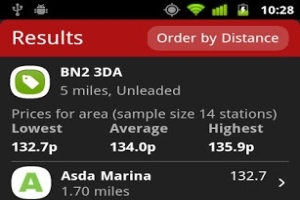 has taken a look at smartphone apps that claim to help you find the cheapest fuel in your area. In this quick test we found that, even if you buy the most expensive app, you could make your money back almost immediately. Our test team downloaded three fuel price apps: Fuelsmart UK, Petrol Finder and PetrolPrices Pro. We ran each one and noted the fuel prices quoted (both petrol and diesel) at five local filling stations. We then visited each of the listed stations to check the prices for accuracy. We also used each app over the course of a week to assess their features and ease of use. The Fuelsmart app cost 69p to download and was good at showing the cheapest local stations. However, the prices stated weren’t always accurate, probably because it relies on users to input the price of fuel at service stations. In contrast, Petrol Prices Pro was fairly good at giving the right prices – it got 27 out of 41 petrol and diesel prices correct, and most of the differences were very minor. One drawback is that it only shows the five cheapest filling stations, so the nearest to your home may not be listed. Petrol Finder was the least useful app, as it simply provides a long list of service stations ordered randomly, many of which were more than 20 miles from the testers’ locations. Should you buy a fuel app? So can you save money with these apps? In our snapshot, petrol prices within a five-mile radius differed by up to 6p per litre, so you could have saved as much as £3.00 on a 50-litre tankful by knowing which station had the cheapest fuel. So, you’re likely to recoup the cost of buying the app the first time you fill up your car’s tank. They are definitely useful if you travel around the country frequently, as you can use them to quickly identify the cheapest places to fill up. However, you could also do this research at home for free – sign up to Petrol Prices on your computer and you’ll get regular price updates via email for free.